Today is a cool October Sunday, and I am glued to the TV, internet and social media as history is being made. Austrian skydiver Felix Baumgartner is going to skydive, attempting to fall faster than the speed of sound, from 120,000 feet over New Mexico. As a former skydiver myself, I am especially captivated by this record-breaking attempt. In honor of Felix and all his support staff on the ground (including an old friend of mine), I thought I would post this New Mexico chile recipe today. It’s my version of a recipe I adapted from here. 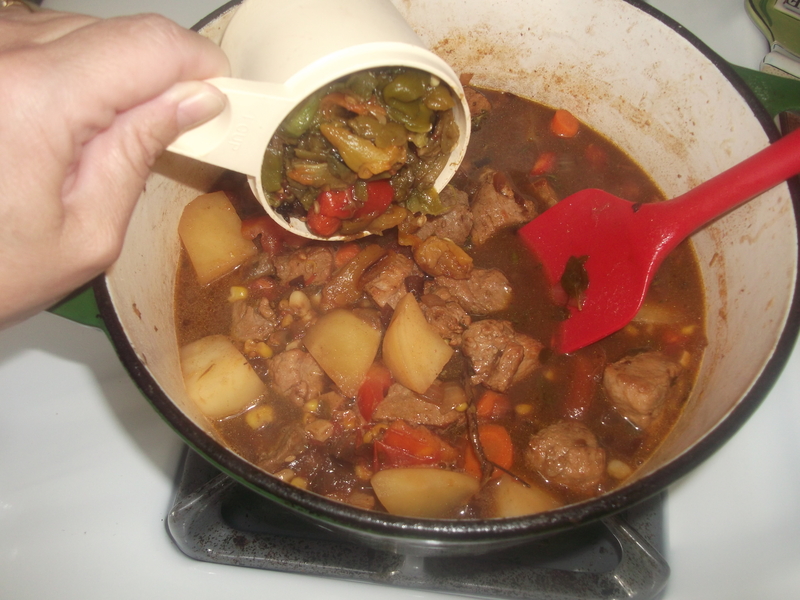 This stew is best with authentic hot chile peppers from New Mexico (Big Jim, Sandia, and/or Hatch), but if you don’t live in New Mexico or have access to these magical peppers, use any combination of local hot peppers you can find. It’s still going to be great. 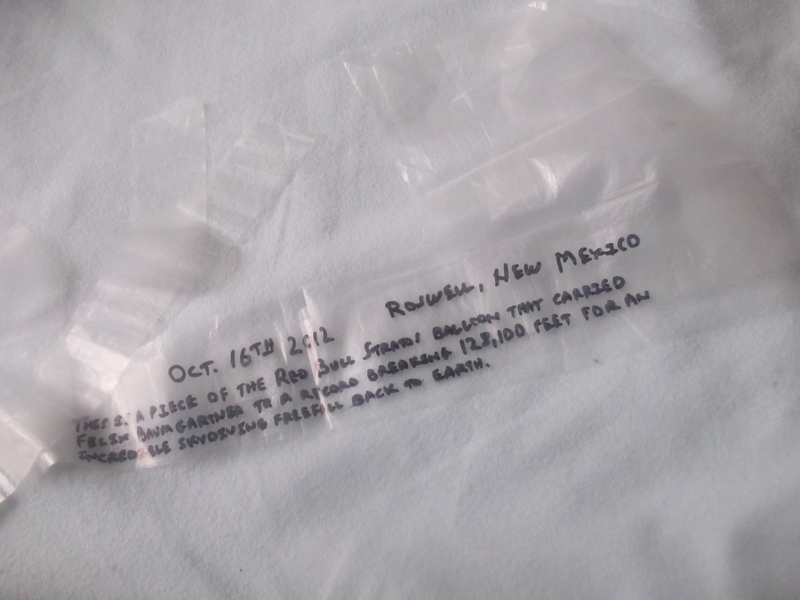 Before we get cooking, I want to share this photo I was lucky enough to get of a piece of the balloon that took him to 128,000+ feet above New Mexico for his remarkable jump. Heat oil in a large Dutch oven or other large covered pot. Add the pork and brown on all sides. 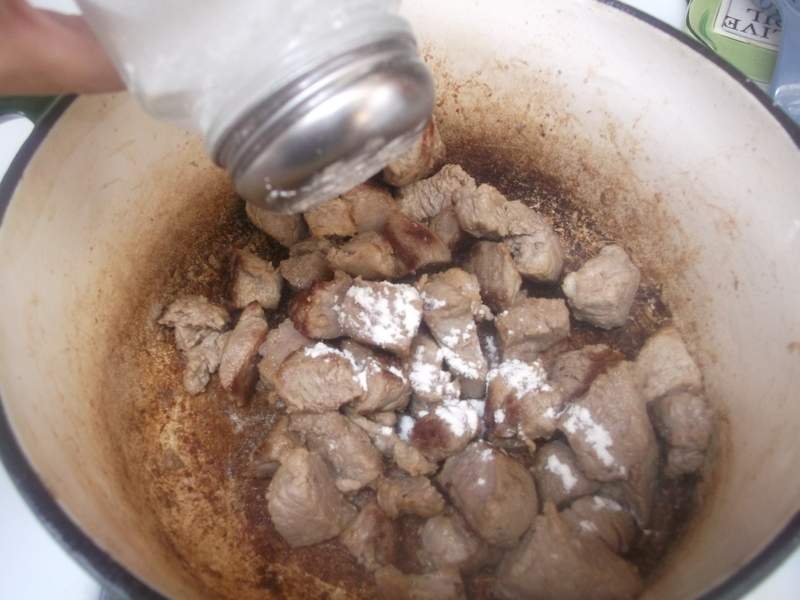 Add the flour and stir to coat, then remove the pork from the pot and set aside. 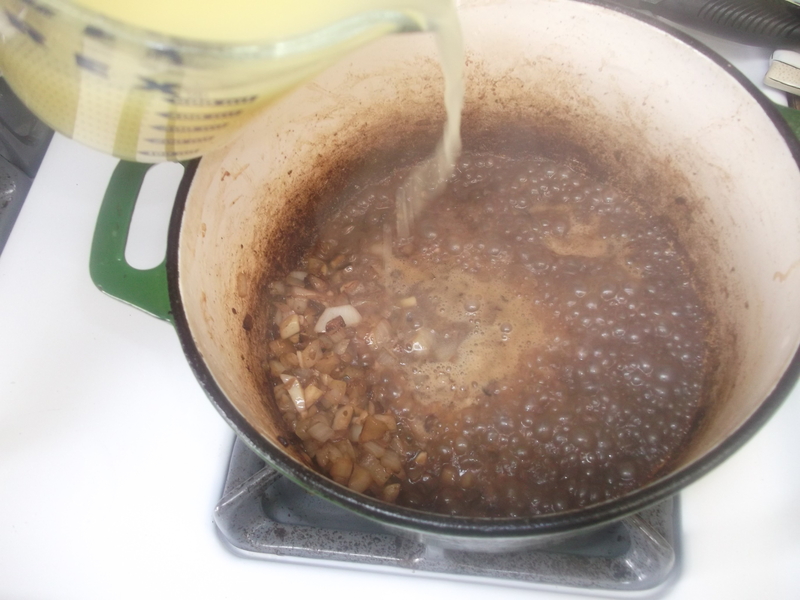 Add butter to the pot; when melted, add the diced onions and cook until lightly browned. Add the minced garlic and cook, stirring, 1-2 minutes, just until aromatic. Pour in the chicken stock and scrape up the browned bits off of the bottom of the pan. Add all the remaining ingredients except the chile peppers. Bring to a slow boil, then cover and reduce to a gentle simmer. After about 30 minutes, add the chile peppers, and cook on low, covered, until pork is tender, about an hour. Do not let it boil: keep it at a low, gentle simmer. The chile peppers will break down a bit into the sauce while cooking. After about an hour, check the consistency of the sauce. If it needs thickening, stir 2 T flour into about ¾ C of cold water and slowly pour that mixture into the sauce, just a little bit at a time, stirring well after each addition. 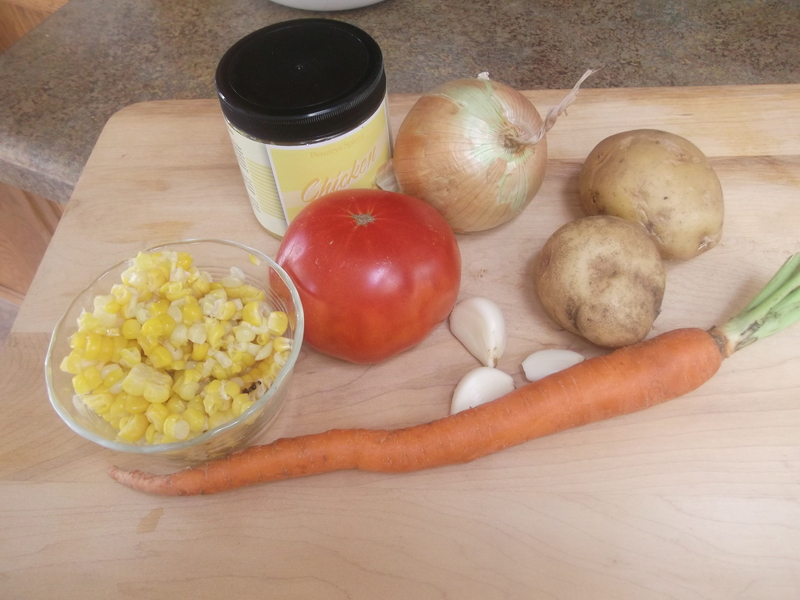 This can be served either as a stew or as a filling for flour tortillas. Garnish with sour cream and chopped cilantro. As always, start by prepping the ingredients first. The most important ingredient to prep is the chile peppers. Read my tips for roasting and peeling them here. I didn’t have any fresh Hatch green chiles on hand when I wrote this blog post, but that’s what I usually use. 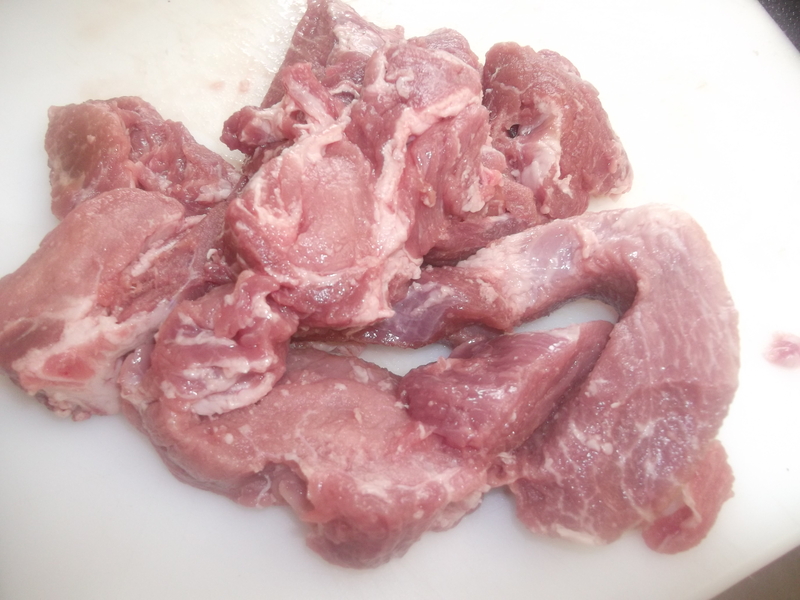 Next, trim the pork from any bones to get about one pound of meat. 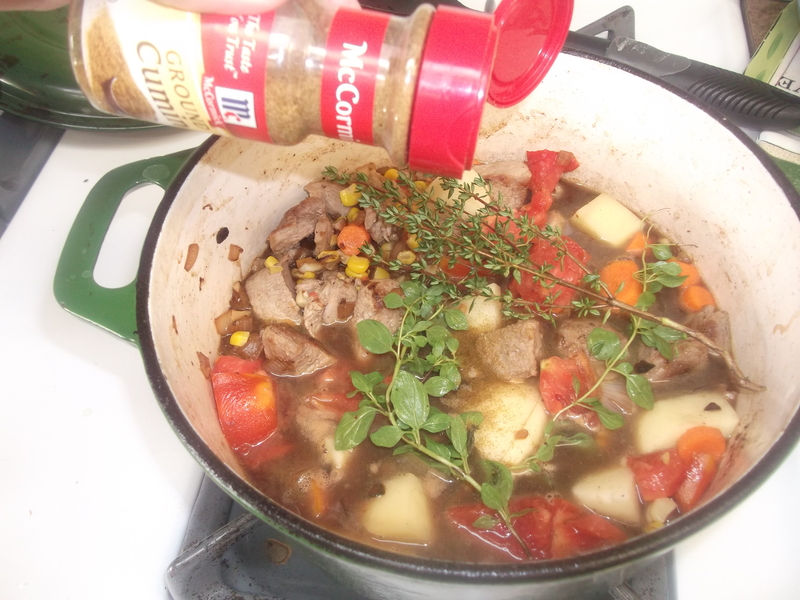 Dice the pork into ½” cubes, and do the same with the onion, potato, tomato and carrot. Set those aside and measure out the chile peppers. 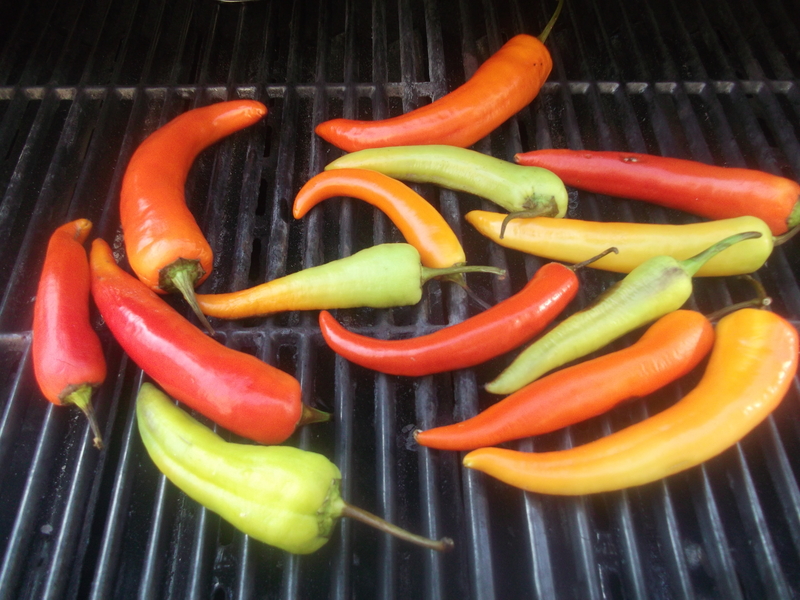 I freeze my roasted peppers, so I used those, also cut into roughly ½” pieces. I used just over 1 C of peppers, and my stew was very hot! (I’m guessing this was about 10 hot peppers, but since they were already roasted, I can’t say for sure.) I’ve scaled back to 1/2 C, and that still has a nice kick without being too overwhelming. If you want it milder, either use fewer hot peppers or use milder peppers. You’ll have to experiment to get the heat you like. Heat oil and add the pork. Brown it on all sides, then add the flour and stir to coat. 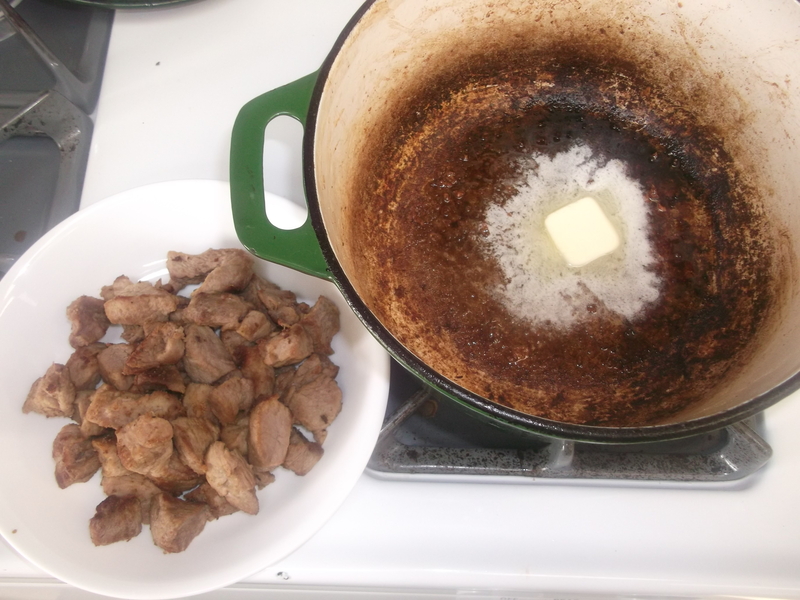 Remove the pork from the pot and set aside. Add butter to the pot and watch it melt. Add the diced onions and cook until lightly browned, then add the minced garlic. 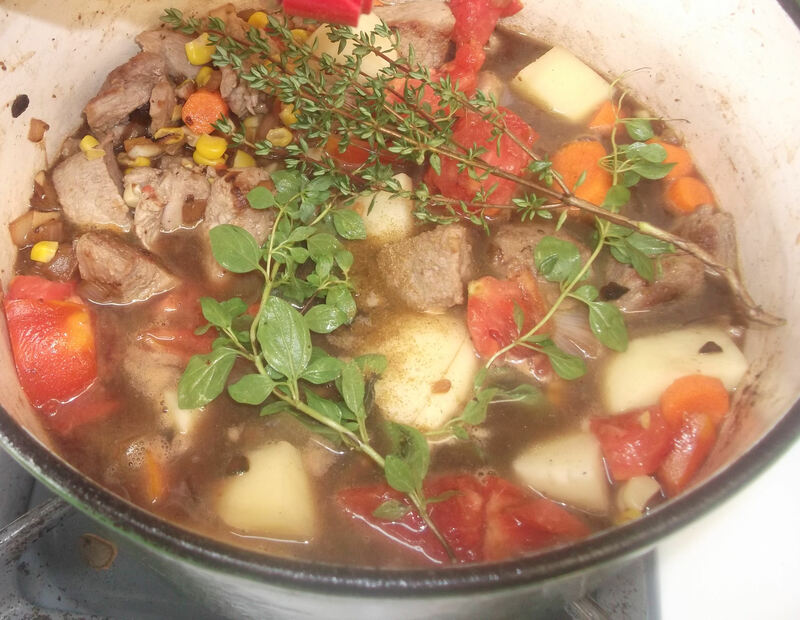 Cook, stirring, 1-2 minutes, until aromatic. And by “aromatic” I mean that the mouthwatering aromas of onion and garlic and pork will start filling your home. Don’t let that distract you, though. The aromas will just keep getting better. Slowly pour in the chicken stock. Stir and scrape the browned bits off the bottom of the pan. Keep stirring and scraping until most of them are loosened, then add the chopped vegetables and pork, along with any accumulated juices. Add the fresh herbs and cumin, but not the chile peppers. Not quite yet. Stir everything together and bring to a slow boil. Cover and reduce to a gentle simmer; let it simmer about 30 minutes. Now it’s time to add the chile peppers. 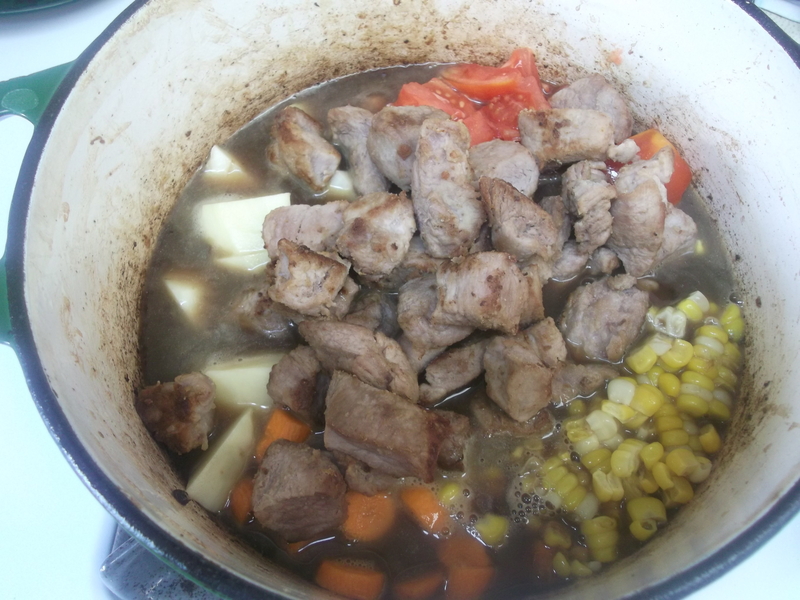 Stir to combine, then cover and cook on low until pork is tender, about an hour. Do not let it boil: keep it at a low, gentle simmer. 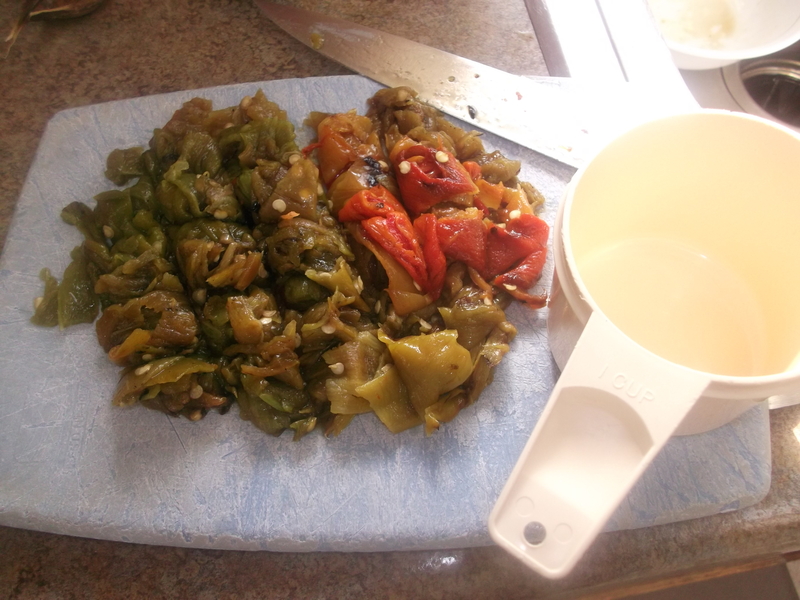 Most of the chile peppers will break down into the sauce while cooking. Season with salt and pepper to taste, and it’s ready to serve. 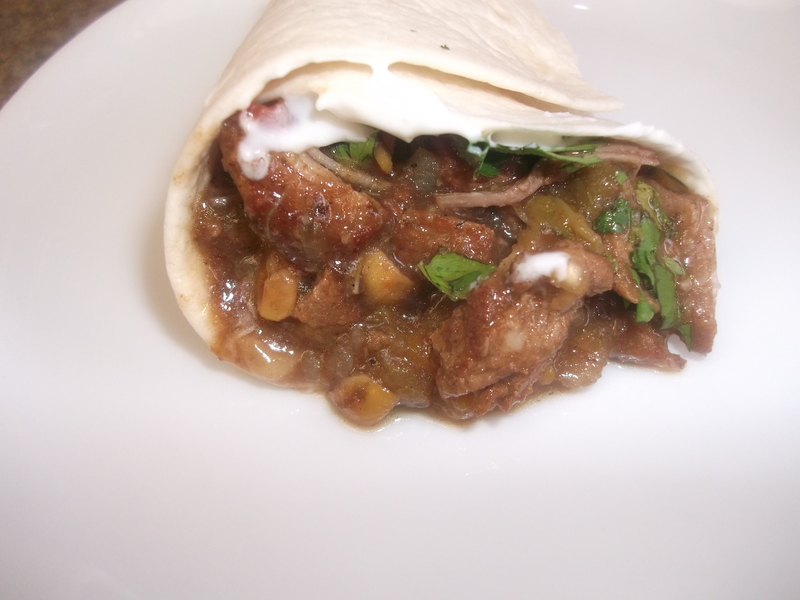 This can be served in a bowl as a stew, or as a filling for a flour tortilla. Garnish with sour cream and chopped cilantro. Either way, you’ll be going back for seconds. Enjoy!